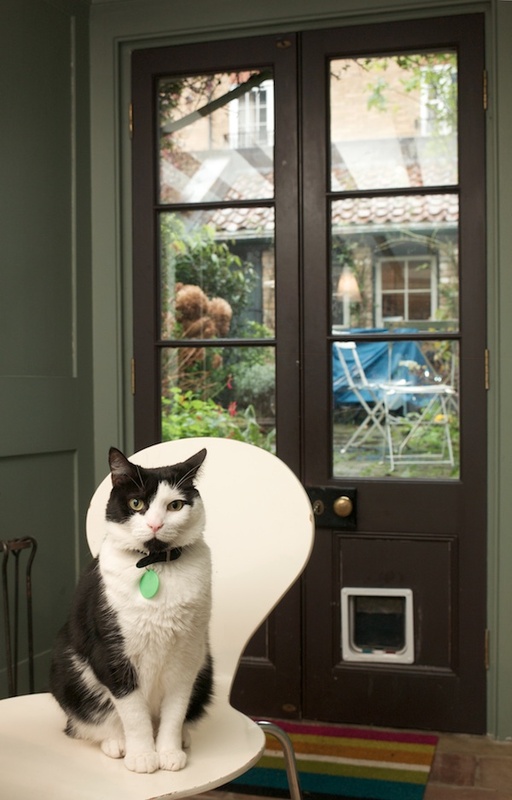 Contributing Photographer Chris Kelly is renowned for her volume of cat photography The Necessary Cat – A Photographer’s Memoir, so I asked her if she would make a survey of the cats of Spitalfields and am delighted to publish her portraits of local felines and their human slaves. 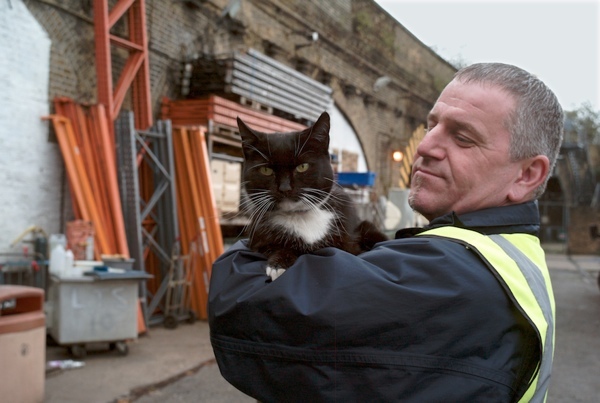 “Sooty came from a London charity called Paws for Life, they rehome elderly cats or those with medical problems. He was a fighting tom taken off the streets and is FIV positive. For the first few months here he just hid in corners, but the whole house is his domain now although heʼs not allowed in the foundry. We got him to deal with the mice and he catches any that come out from under the cooker. He sleeps upstairs with our two girls and follows us around. Itʼs lovely to have him here, especially if any one of us is alone in the house. We think heʼs about seven or eight. Heʼs fairly scarred and scabbed and half of one ear is missing. He likes to be king of the castle. Heʼs usually fine with girls, although heʼll give ours a nip if theyʼre a bit slow to put out his breakfast. He doesnʼt like men much, especially if theyʼre wearing big boots and he only comes down to the office when the men have gone home. He loves listening to music but only piano music and singing, he hates the trumpet and violin. 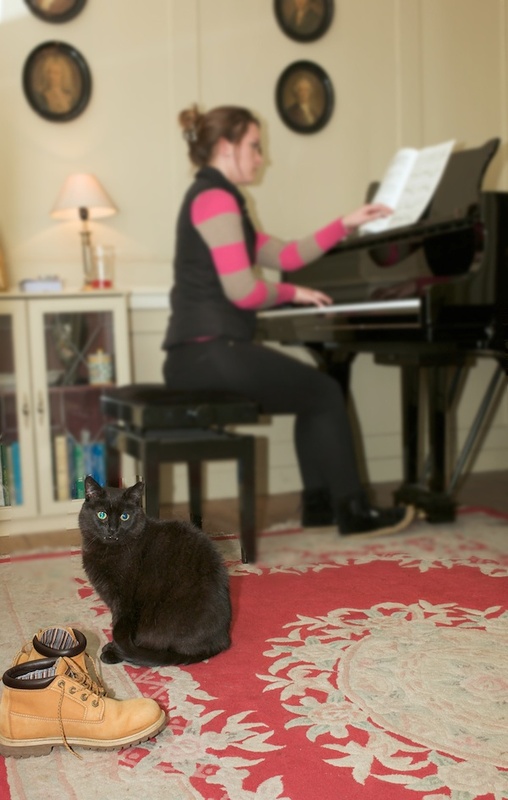 He sometimes sits on a chair near the piano when my daughter is playing. Our previous cat Sandy walked in off the street and stayed for ten years. 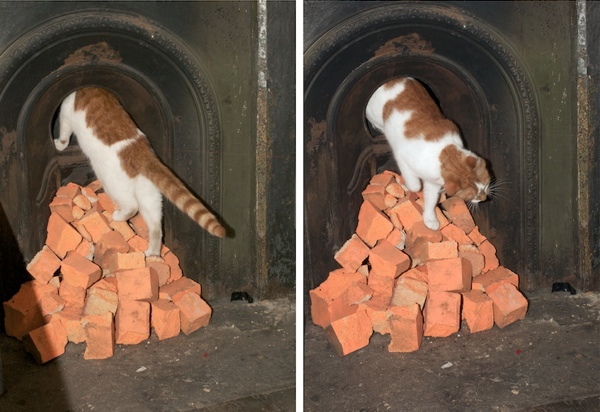 He was the complete feral cat, he could climb a vertical ladder in the yard and be away over the rooftops. He was never really ours. He was an excellent ratter and there were plenty of the nasty large creatures around when foundations were being rebuilt. Heʼd present them to us, of course. 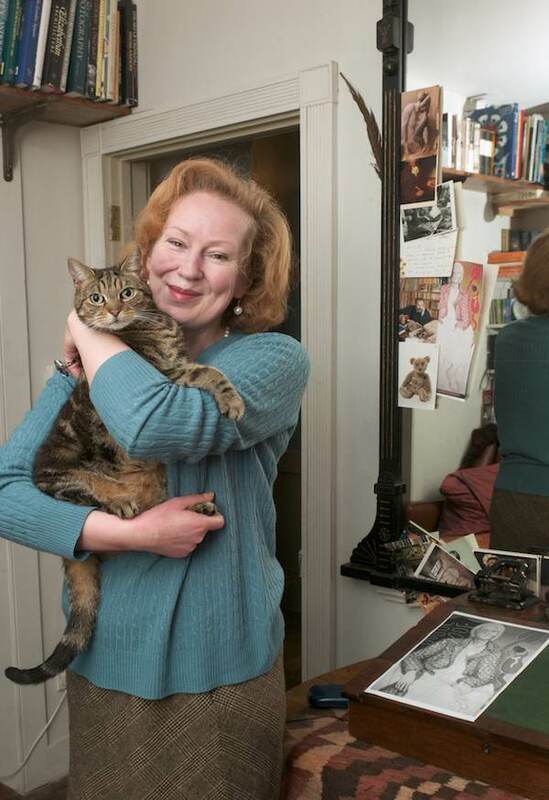 “I was mourning my last cat for two years and I didnʼt want another cat. 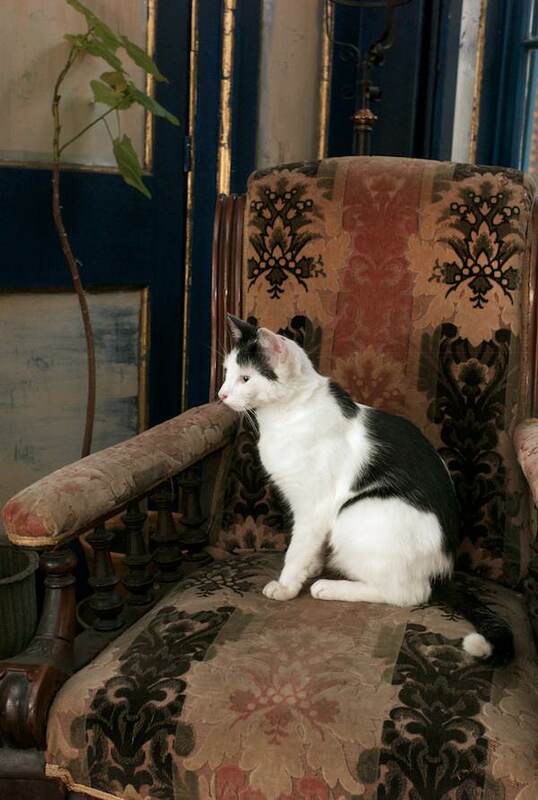 But then mice moved into the guest rooms upstairs, so I went to a cat rescue place just before Christmas last year. 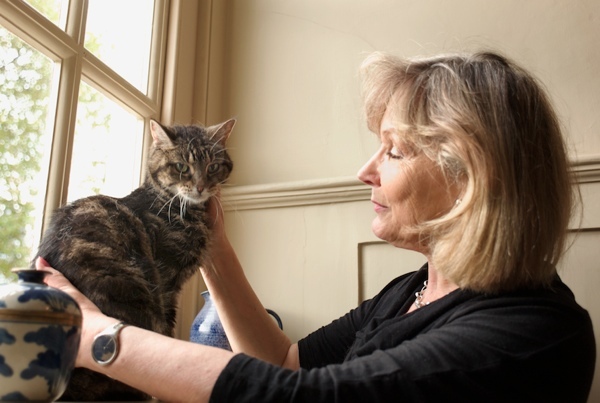 It was like an adoption agency – I had to be interviewed but there was no problem because Iʼve kept cats for forty years. They phoned me after a while and I had to explain that the cats were undergoing a personality change due to being renamed. Then he became well known in the cafe too. He liked to be with the customers, and children from the local school would stop and talk to him. Unfortunately, we had a visit from the environmental health people and heʼs banned from the cafe now. 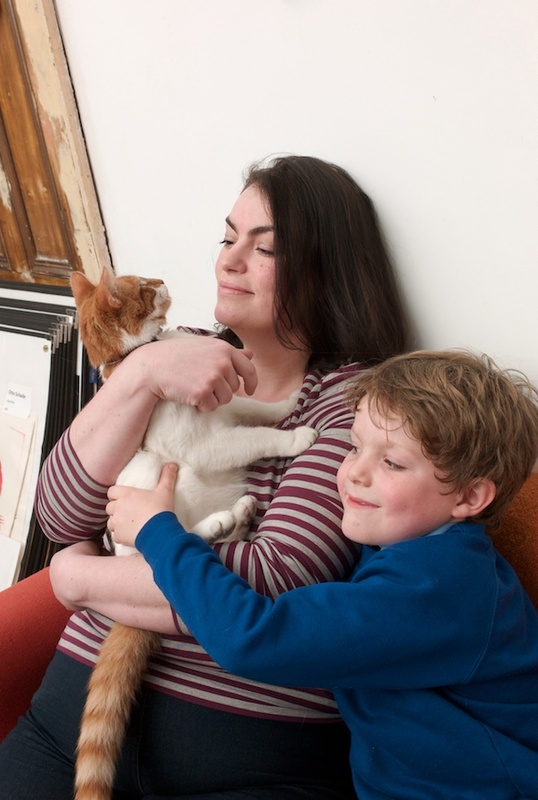 Sparkly was twelve weeks old when he came and my son Harvey was only three, but Battersea are fantastic about matching cats with families. Sparkly was a lot more forgiving then he might have been. 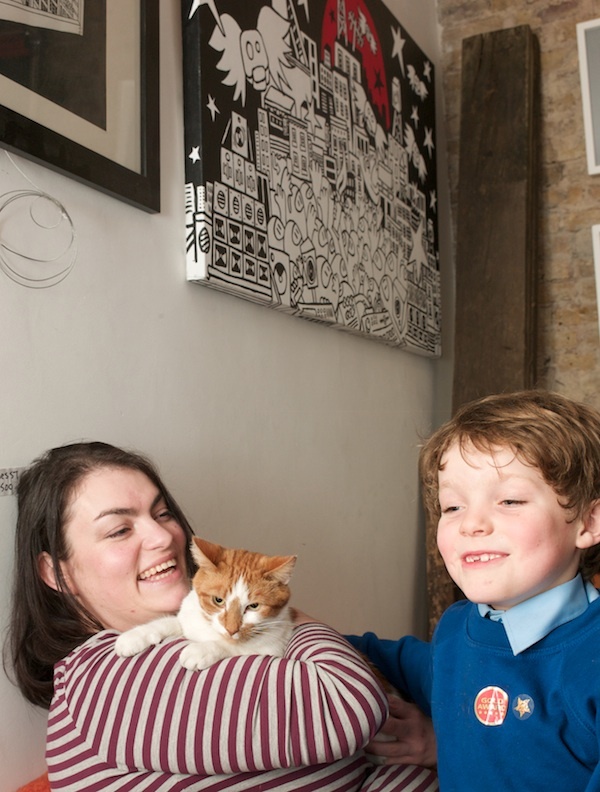 “Rupert Blanchard (cat person) met Polly Benford (dog person) in Swindon in 1999 and in 2003, they moved in together in Hackney. The guys next door got a pair of cats to deal with mice, but moved to Mexico after having had the cats for only six months. Polly turned into a cat person because, she says, “Carlos is gentle and friendly like a dog” and we inherited the cats. 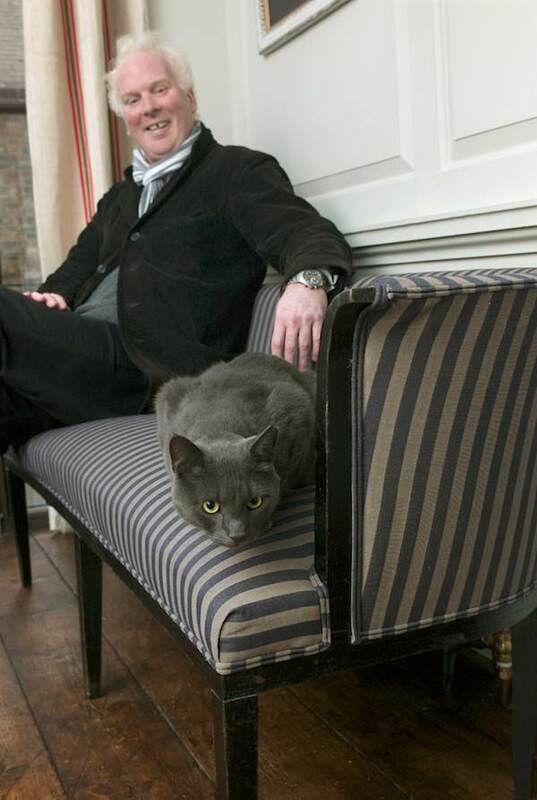 The cats had been named Carlos and Sofia after King Juan Carlos and Queen Sofia of Spain. The first week we had Sofia and Carlos, they presented us with six mice. We havenʼt seen another one since, although one of the cats caught a moth recently. 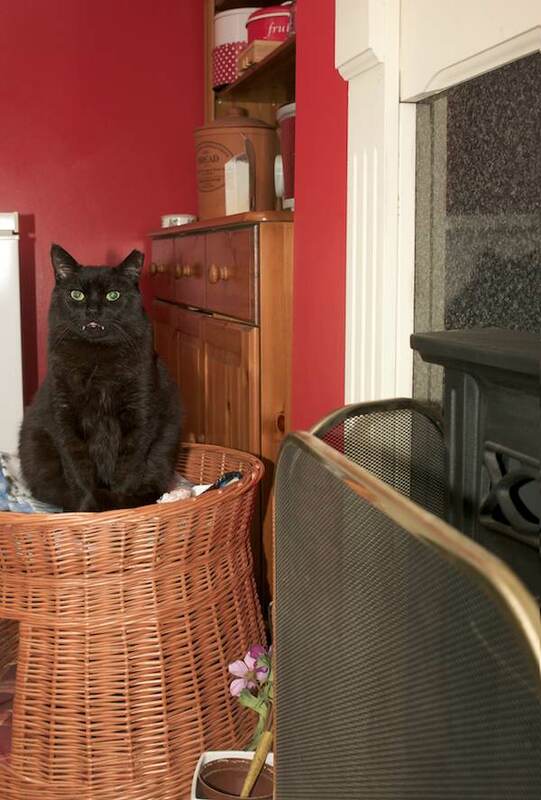 They have a holiday once a year in the Wiltshire countryside with six other family cats. Just about everyone in the family has cats. Carlos always dominates. “Opera is my passion and Theodora is named after an opera. Maybe the next kitty will be called Aida, Nora or Maria Stuada! Theodora, or “Dorable Dora” as she also is known, is my granny cat. 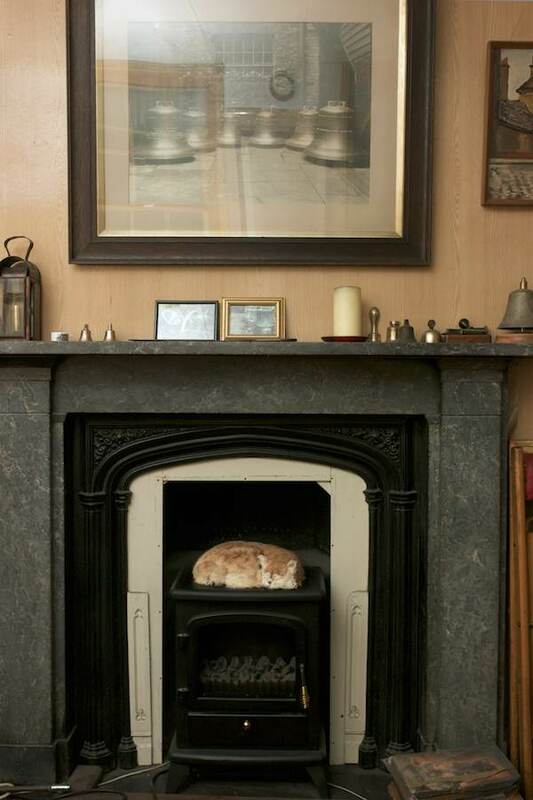 She sleeps twenty-two hours of the day and night in front of the Aga dreaming. During the remaining two hours, always from 2.00am to 4.00am, she climbs three floors to tell me about these dreams. I get a swipe across my face to wake me up to listen. And then she plays like a kitten and relates every detail of her dreams. Aghhhh…but I love her dearly. When Theodora has told me everything she can remember she jumps off the bed and, if I am lucky, I get to sleep. If not, memories of all my furry family come flooding back – Puppy, Gorgeous Ginger Tom, Miss Gingerbits, Debbie & Greta, Dee Dee & Kennington. All were strays and some were in the most appalling condition, but they were all wonderful characters who shared and enhanced my life. 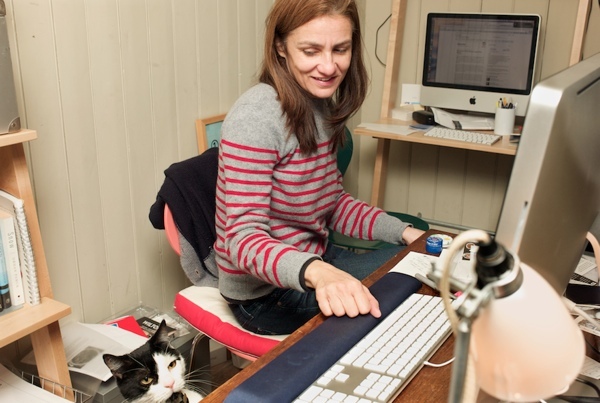 “Iʼve worked here for a couple of years. Itʼs a family business and Daniel the owner is my cousin. Bungy, the black and white cat and Shadow, the black cat, live on the premises. Theyʼre both good mousers and Shadow loves a pigeon. I feed them both – Shadow prefers dry food and Bungy likes wet food. Shadow turned up about a year and a half ago. He could be from anywhere because he tends to jump into strange vans. Someone put Bungy through the fence when he was just a kitten and heʼs been here for about eight or ten years. The ashes of Madge’s predecessor are in the urn. 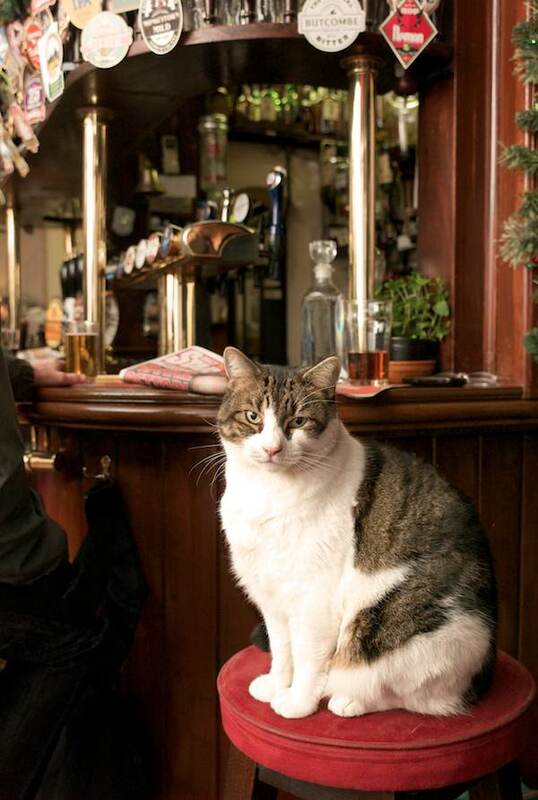 “Thereʼs always been a cat here, and the last three have been called Madge. 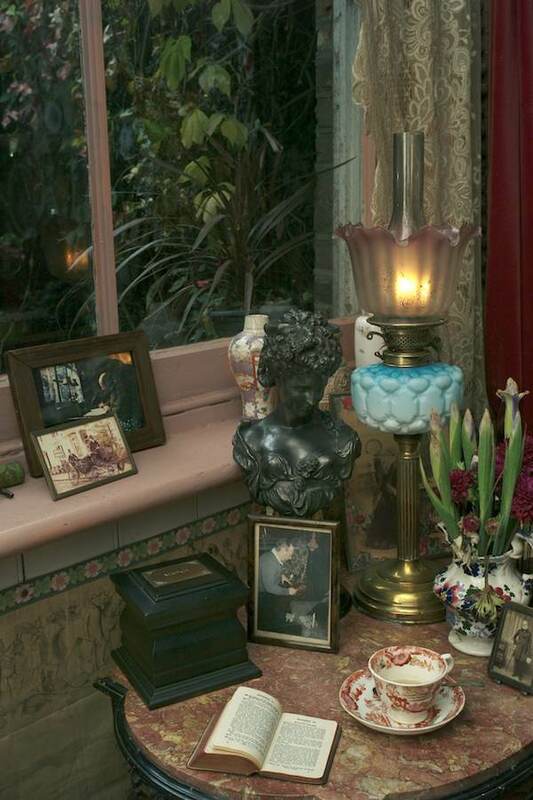 The first Madge was buried in the back yard in September 1991, and the ashes of the second cat are in an urn in the Victorian room beneath a portrait of Dennis Severs. 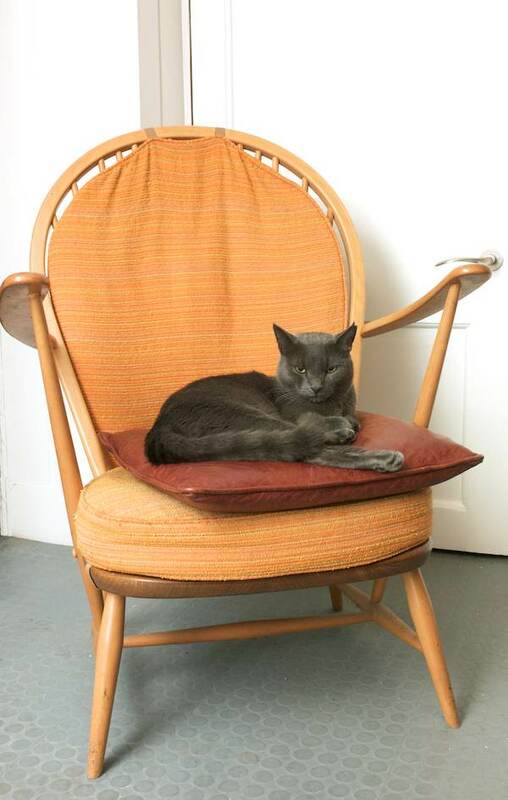 The current Madge came from a rescue place in Hackney. She was a bit frightened at first but she was only a baby, so we kept her in the office then slowly took her out into the rest of the house. Now she has secret places all over the house, including the attic. We donʼt know where she goes. Sheʼs often around during visits. Unfortunately, some people think sheʼs a prop and give her a prod. Sheʼll respond with a miaow or a nip. 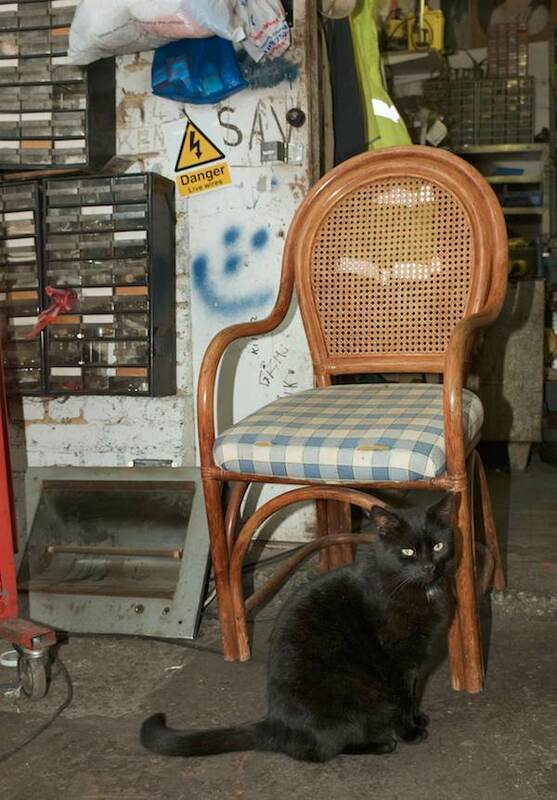 She often sits in the same places and the same chairs that the previous cat liked. She knows we put food out when the visitors come and she likes licking the butter off the toast. And sheʼs been known to tip over the eggs and eat the yolk. She likes to be outside on the terrace in warm weather. She has friends too. She goes into Tedʼs house next door. I donʼt live here but Dennis and I were good mates and I always enjoyed the house before I became Curator. 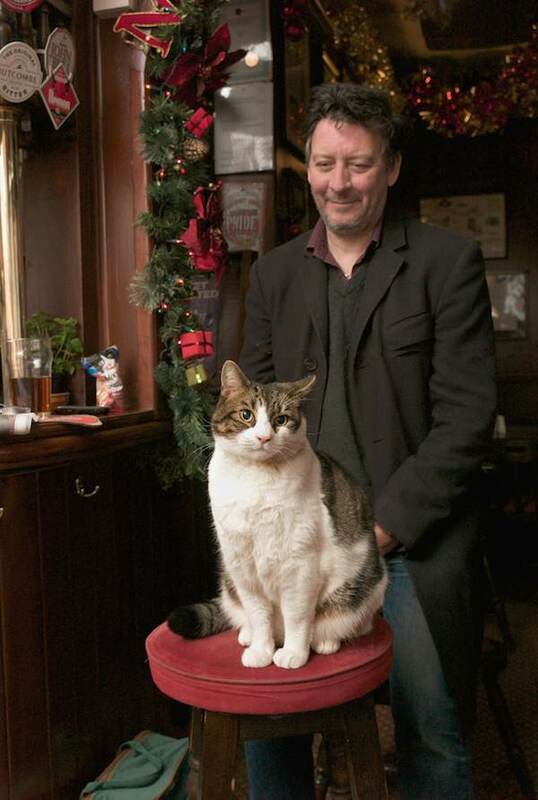 Lenny, pub cat at The Pride of Spitalfields, with admirer Dean Whatmuff. Lenny snuggles in a cosy corner. Lenny napping watched over by Terry Hutton. 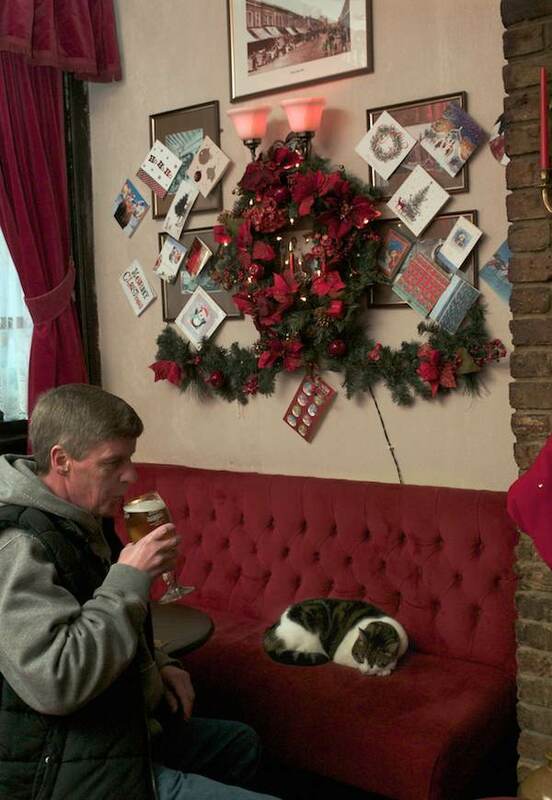 Lenny at The Pride of Spitalfields with Anne Butler, landlady & Terry Hutton & Dean Whatmuff, regulars. 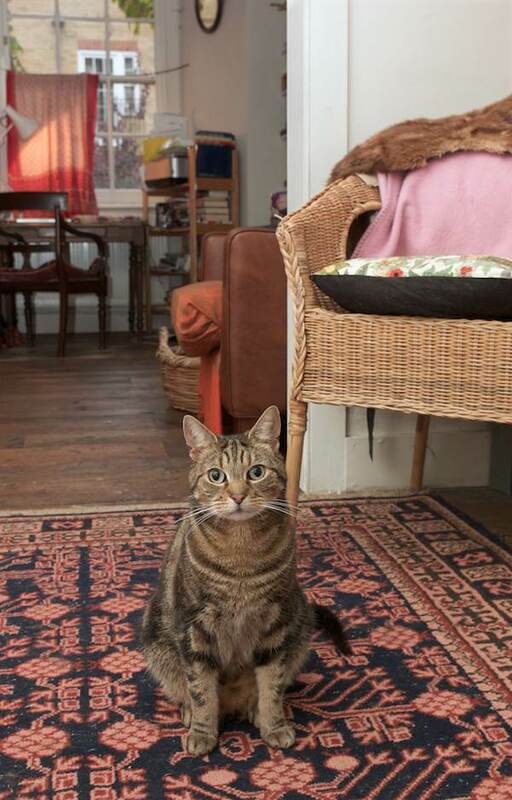 “Battie is a rescue cat, heʼs half Bengal and half Fat Tabby. There was a pair of kittens and this little cat on its own in a box looking miserable. 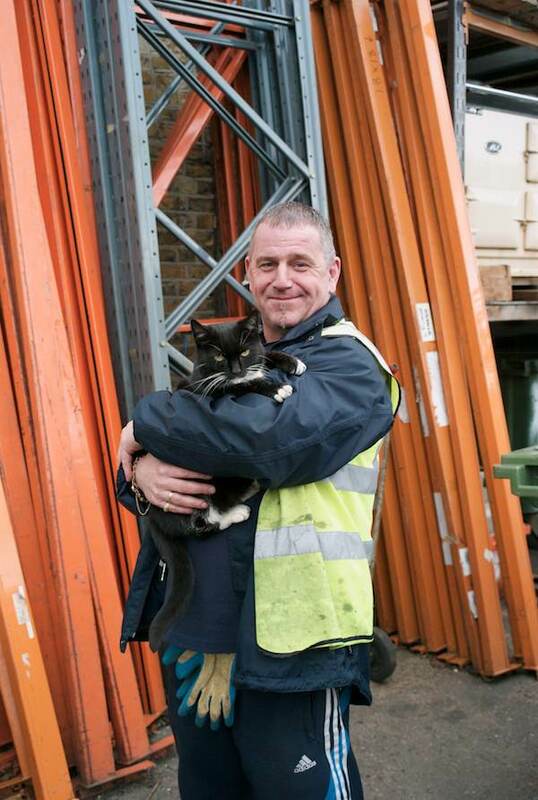 Suddenly, he jumped into my arms – and I gave him back because Iʼm heartless. So he walked round my legs and sprayed me like a tree. Iʼd been marked out as his. “Weʼve only had Ambrosia for four and a half months. 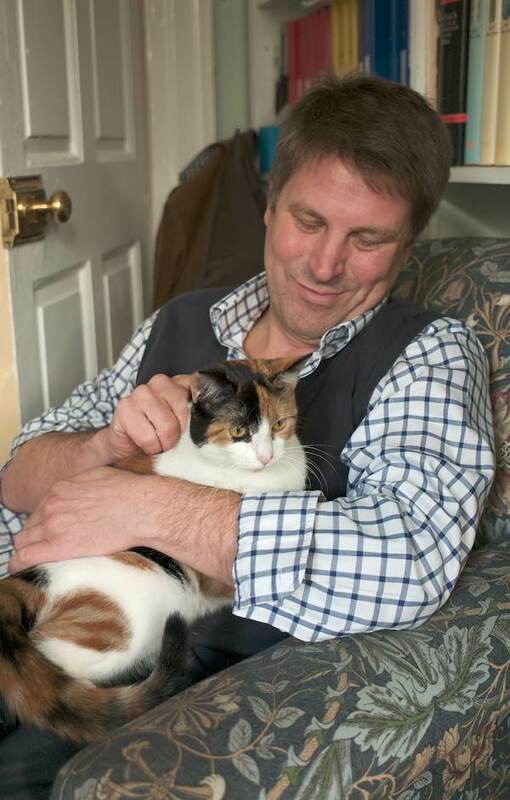 We wanted a tortoiseshell and her name had to begin with the letter A, so sheʼs named after my favourite pudding. Our golden retriever, Archie, is her role model. She definitely aspires to be a dog and she doesnʼt realise sheʼs quite small. Sheʼll make a dive and hang on to Archieʼs leg but, luckily, heʼs very tolerant. I always say Iʼm not all that bothered about pets, but my wife would dispute that. 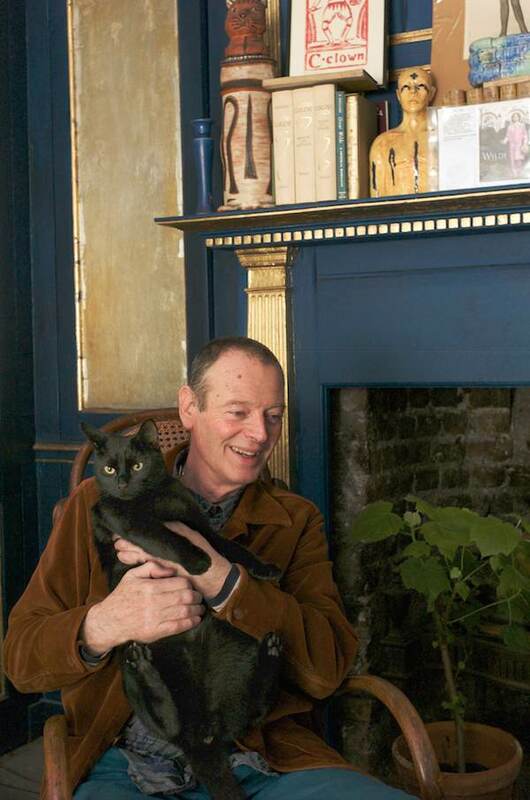 Our first cats here came from Eric Elstob, who lived in Fournier St. 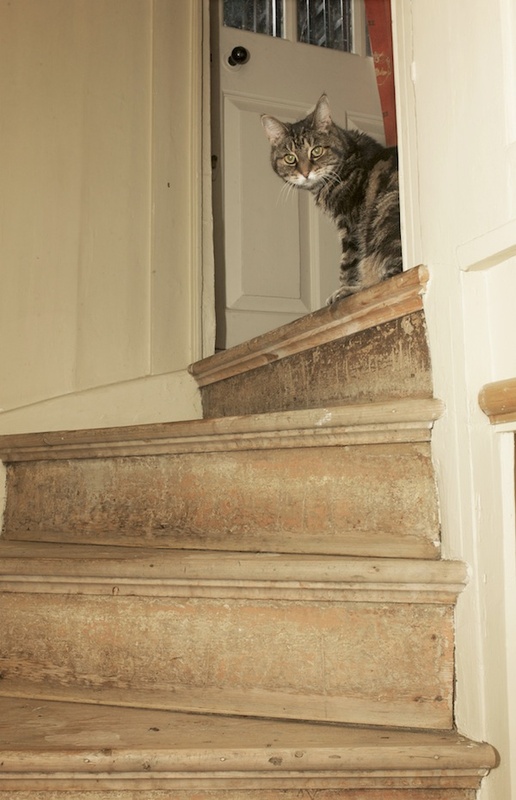 He was one of the great champions of the restoration of Christ Church and, when he died in 2003, his house-keeper asked us to take on the two cats Julio & Antonio. 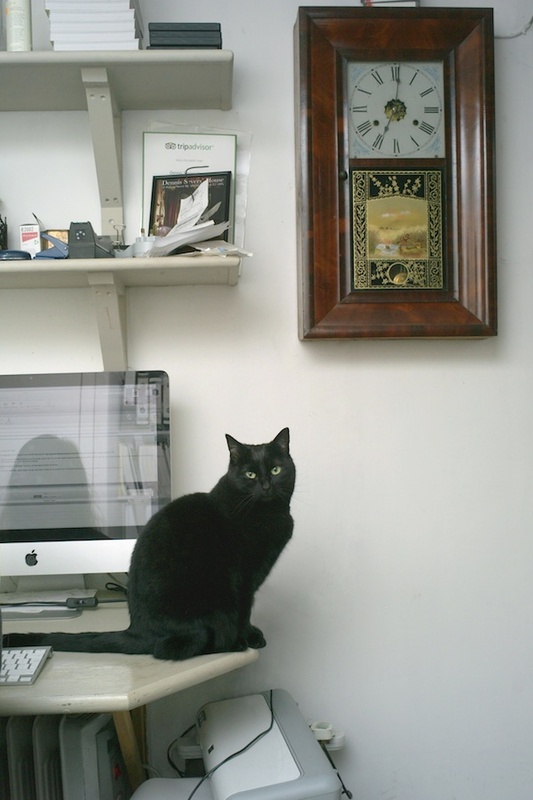 Towards the end of their lives, we thought weʼd better have a new cat to take over mousing duties. So far no results from Ambrosia, but weʼre encouraged by some scurrying under kitchen cupboards. 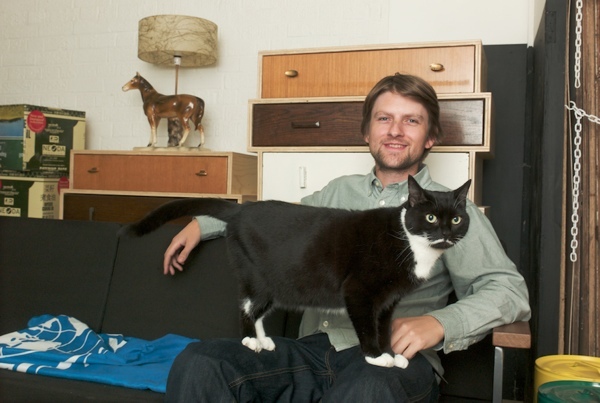 “Mittens came from the 5th Ave Cat Clinic, Brooklyn. Sheʼd been in the window for a while with a sign saying CAT FOR SALE. 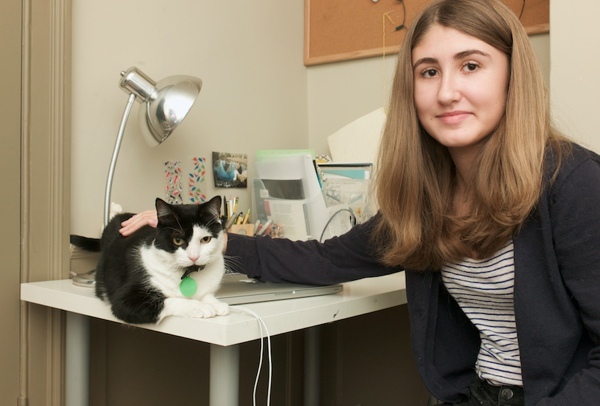 My daughter Yasmin used to walk past the window and she really wanted this cat. When she saw the SOLD sign she was so disappointed. 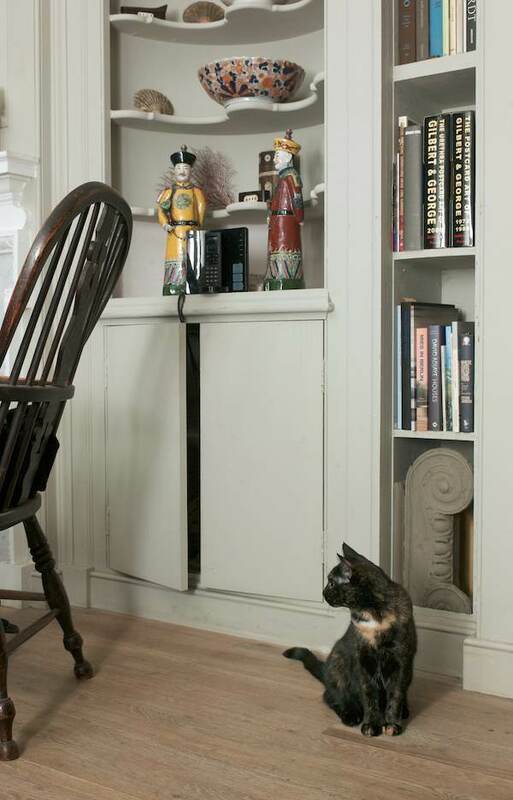 Luckily for her, Iʼd just bought the cat. Bringing her back to this country was a complicated business – there were problems with the microchip (the vet put in an American chip instead of a European standard one), there were questions about the size of the crate, she was driven from Heathrow to Aldgate in a Defra endorsed van, and the whole operation cost a fortune. 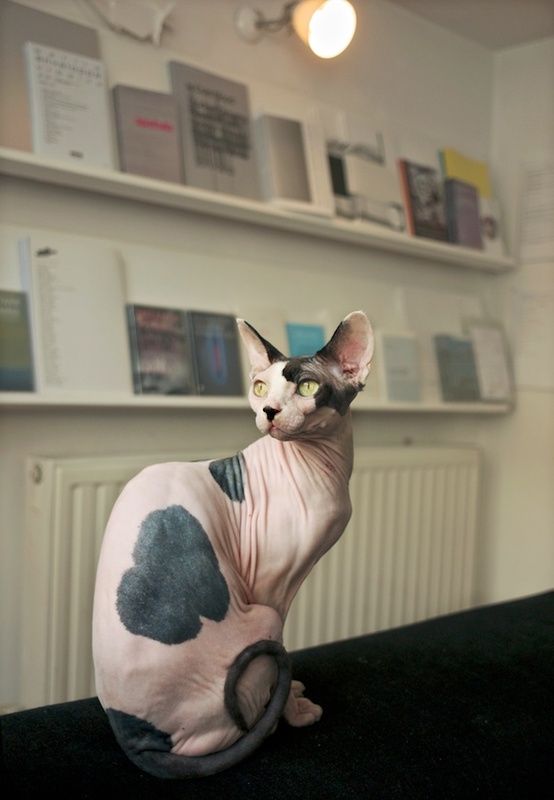 “Sebastian & Cordelia are Sphinx cats. They are named after characters in Brideshead Revisited and theyʼve grown into their namesakes. Sebastian is a bit roguish and he eats anything he can find – he once tried to eat staples – whereas Cordelia is more sensible, she tells him off and looks after him a bit. Iʼve always liked this breed. I saw a picture of them in a book once when I was a child and immediately wanted to have one. And theyʼre the friendliest of all breeds. Mark likes them because he studied axolotl salamanders in a biology class and he thinks their faces are similar. They came from a north London breeder. We just wanted Sebastian, but at our interview Cordelia took a shine to Mark so then we had to have them both. Theyʼre brother and sister and they were three and a half years old in March. Theyʼre quite high maintenance, they have to be bathed once a week and have their ears and claws cleaned. They live with us at the gallery, so thereʼs constant stimulation and they are always around when people come to the gallery. 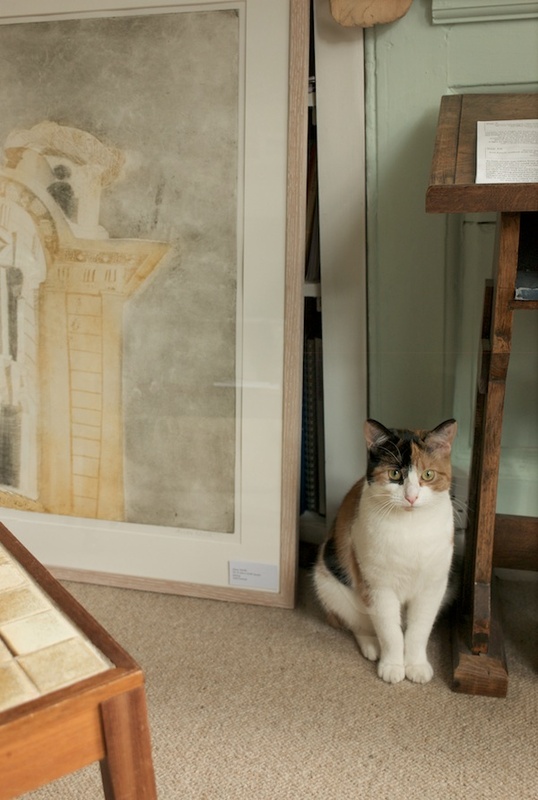 Our exhibitions are constantly changing and some of our artists produce particularly cat-friendly work. Sebastian & Cordelia joined in during a session of voice recording recently. 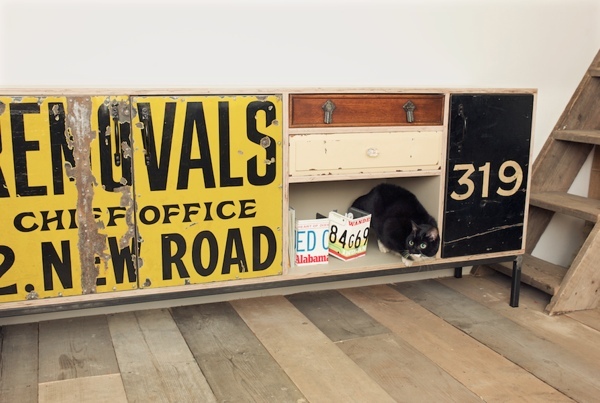 “Truman came from a Mare St pet shop. His father is a Russian Blue and his mother a Norwegian Long Hair. We bought him as a kitten in 2009 and our other cat, Stella, came six months later. 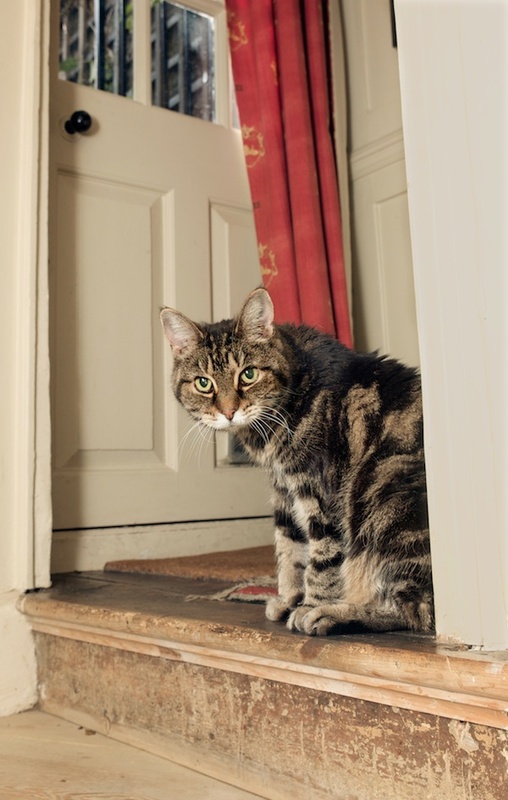 We found her very pregnant mother on the doorstep of Number Eleven and took her to Samantha Morton who lives nearby because we knew she looked after cats. So when the cat produced her litter the very next day, we felt obliged to have one of the kittens. 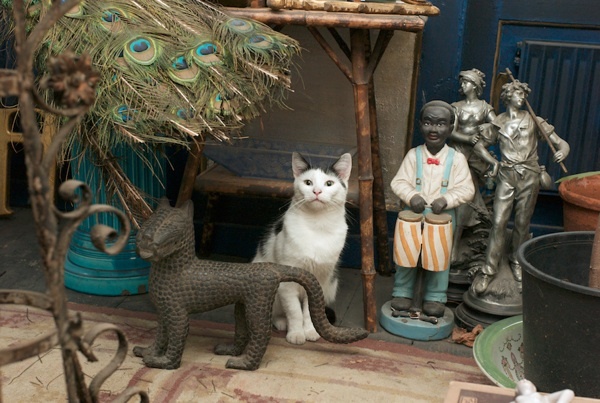 And Truman was going slightly nutty on his own – these cats love company, they always want to join the party. You never know with cats how the chemistry will work. Stella is basically a street cat, sheʼs a mixture of ginger tabby and tortoiseshell and sheʼs always been very nervous. The two of them get on reasonably well although Truman picks on her if he gets bored. But she fights back and now heʼs got a bit of ear missing, so heʼs more careful. Theyʼve both fallen from the parapet of the gallery. Truman used to run around on the rooftops and, one wet day, he fell off. Fortunately, he landed on all fours but his chin was bruised. He never did it again. Stella has done the same too, so theyʼve both fallen three storeys to solid ground and are still standing. 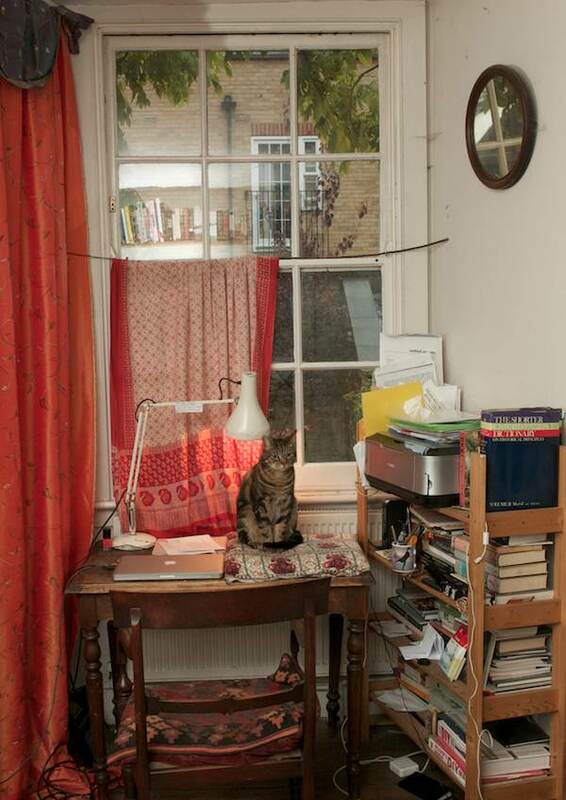 Chris Kelly’s THE NECESSARY CAT – A PHOTOGRAPHER’S MEMOIR is available from many independent bookshops including Brick Lane Books, Broadway Books & Newham Bookshop. This one’s a really good article. 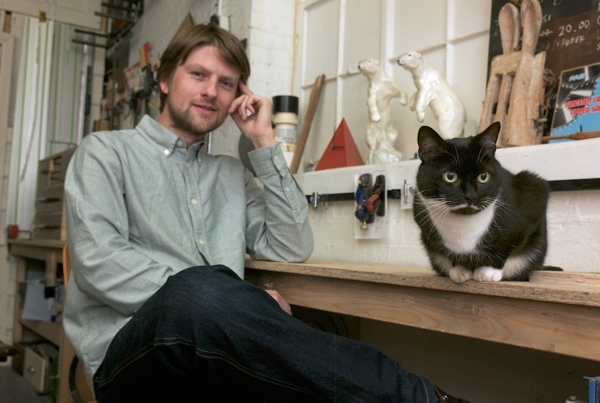 I like the Bell Foundry cat and the “Pride of Spitalfields” one too. Always love it when they catch a rat – means to me they’re earning their keep!!! Pure self endulgence (for me!) – but lovely! Very many thanks for the blog.